Preliminary Chart No. 3 of the Sea Coast of the United States from Portland Maine to Race Point Mass. A rare hand colored 1857 coastal chart of the Massachusetts coast line. Covers from Howland's Ledge (south of Boston) north through Boston Proper, Minot's Ledge, north past Nahaset, Lynn, Beverly, Salem to Gloucester and Cape Ann, Essex, Ipswich, Newburyport all the way to Portsmouth New Hampshire. Includes Provincetown and the northernmost part of Cape Cod. Detailed depth soundings and sailing references, including lighthouses, throughout. The left side of the map includes detail information regarding Light Houses, Beacons, Sailing instructions, and tides. 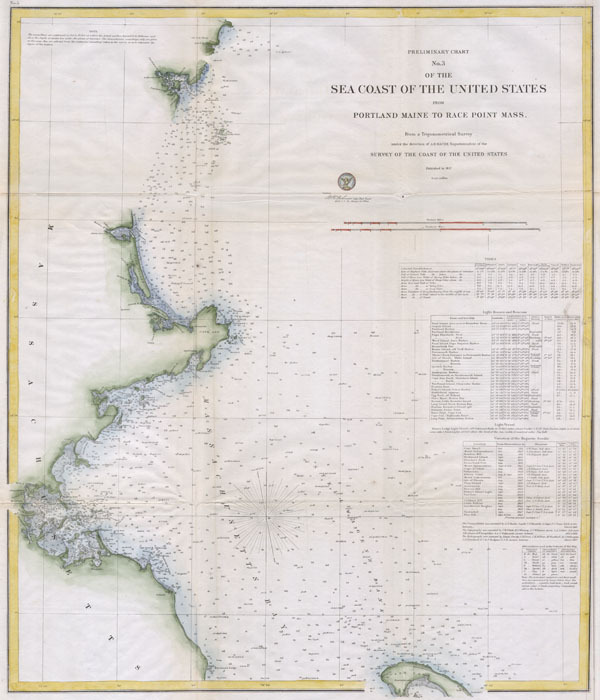 Published under the supervision of A. D. Bache for the 1857 Report of the Superintendant of the U.S. Coast Survey. Report of the Superintendant of the U.S. Coast Survey, (1857 edition).